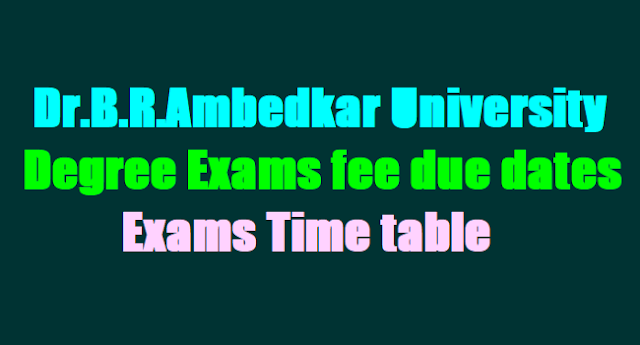 Dr.B.R.Ambedkar University UG Supply 2017 Exam Notification/ Dr.B.R.Ambedkar University Degree 1st, 2nd, 3rd year Exams Time table / Dr.B.R.Ambedkar University BA, BSc, BCom, BBM Degree Exams Schedule/ Dr.B.R.Ambedkar University Degree Exams Fee due dates notification:Dr.B.R.Ambedkar University Degree Supplementary Exams fee due dates 2017. Exams Time table. Supplementary Examinations, July/ August 2017 - Examination Schedule - Intimation - Regarding. Ref: 1) Resolution of Examination Committee, Dated: 23-06-2017. 2) Note Orders of the Vice – Chancellor, Dated: 24-06-2017. With reference to the above, I am by direction to inform you that the following is the Examination Schedule of B.A, B.Sc, B.Com & B.B.M First, Second and Third Year Supplementary Examinations to be held in July/ August 2017.
a) For Single Paper of Each year A, B.Sc, B.Com and B.B.M. c) For Three or More Paper – Whole Examination Fees + Application Registration Fee. You are requested to circulate the above Examination schedule among Students of your college and upload the student data for Online Registration as per the specified dates mentioned above and submit the Hard copies of student data along with consolidated D.Ds to Dean of Examinations, Dr.BRAU, Srikakulam as per the above schedule. All the principals are requested that the following guidelines of Dr.BRAU, Srikakulam must be taken into consideration while submitting the data for Online Registration for First, Second and Third Year Supplementary Examination, July/August 2017.
b) Demand Drafts obtained prior to the date of issue of the Examination notification will not be accepted.